What to do with old brick. We had purchased a bunch of old brick from someone that had to get rid of it. And he sold it to us at a very low price...less than 10¢ per brick. Initially, we laid this at the end of our driveway for our daughter to park her car when she began driving. Here is a picture of the basket weave design that I laid. It started off level but this area gets really wet in the rains and it didn't stay flat for long with the weight of her car. Our new garage was built in this very location! Straight ahead is the brick pad that our daughter used to park on. Now the new garage sits on this location. See the brick pillar that holds the sundial that my son made me? However, there still was quite a bit of old brick to be used. 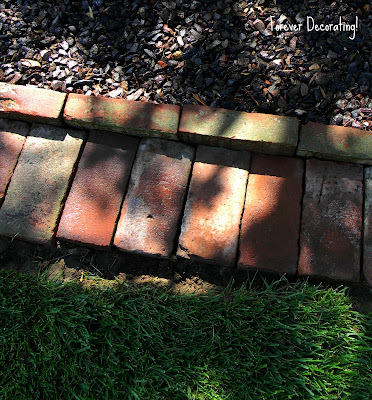 I had soldiered brick on the border of flower beds at our old house and loved the look, but the work was truly back breaking and I wasn't looking forward to doing it again. But that doesn't keep me down, so gathered up my strength and bordered the front rock wall beds with this same soldiering effect. A single row of brick BEFORE the brick soldiering. So clean and neat looking and easy to maintain. I am glad that I did it even though my back is not happy right now. 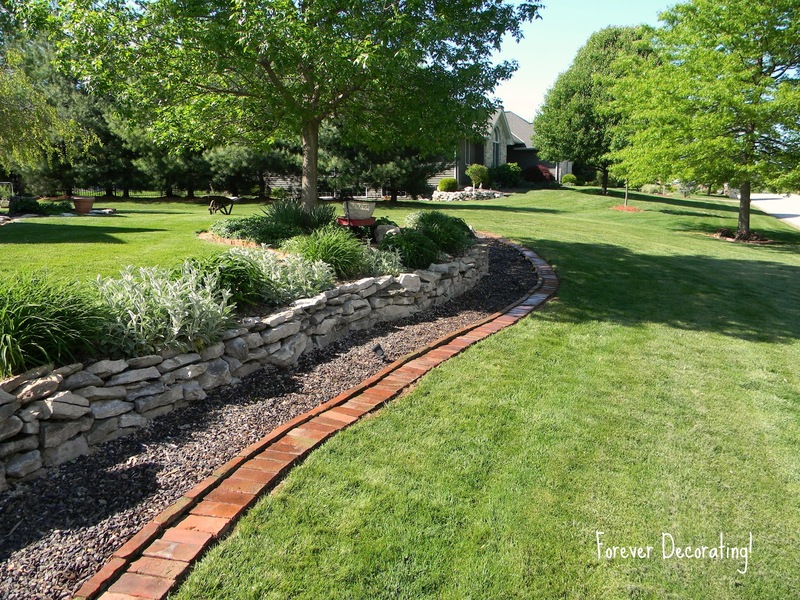 Hi Terry, I love old bricks and your yard is gorgeous! I especially like how you used them as a border around the curved flower beds. I so appreciate you coming by my little blog and leaving kind words about my tin ceiling tiles. Wow Terry - that is beautiful - fabulous. I so have to work on the exterior of my home. Thanks for commenting about my ceiling design...much appreciated. I just followed you...could you do the same? I think you did a fantastic job with the brick framing. I love this idea.I may try this on the side and front of our yard.Now I have to see if I get lucky and find bricks that cheap.Your yard is beautiful. Wow my back would hurt too,but it looks stunning and jsut think they will be there forever now! That looks just beautiful! Job well done. What a gorgeous yard you have! Those bricks are the perfect border! You have a beautiful property! We are trying to civilize our back garden, and my husband has been making borders, etc. I saved one of your photos to show him. Thanks for the idea. That looks beautiful! And, it is probably wide enough for the lawnmower tire to go over which will eliminate going back over with the edger or string trimmer! My hubby would love it if I did that! I did the same thing in my backyard with the leftover bricks from building our house. Now I need another pallet full! 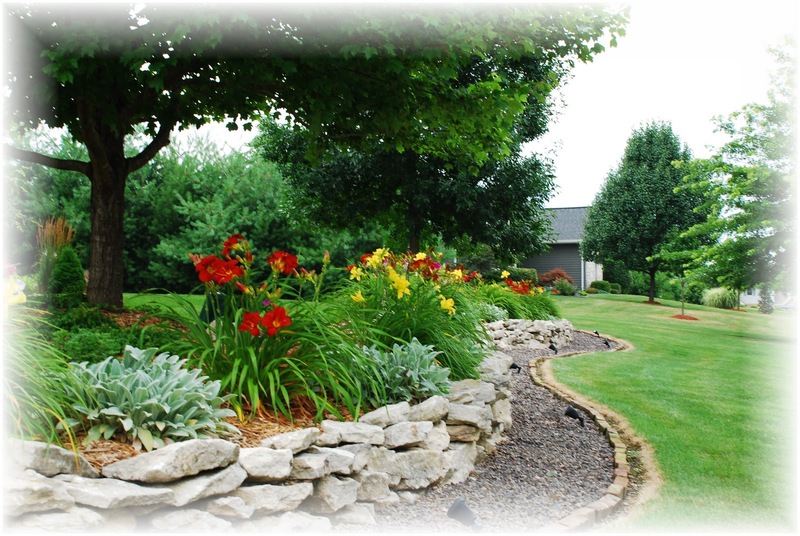 Love your yard! I love it..Brick is my favorite..You did an great job and it looks amazing! You have such a beautiful yard and its so green..Pretty, Pretty, Pretty! Hi Terry! Oh, everything looks beautiful. You did a great job with all of your brick! Your yard is gorgeous. What a wonderful way to reuse these bricks. 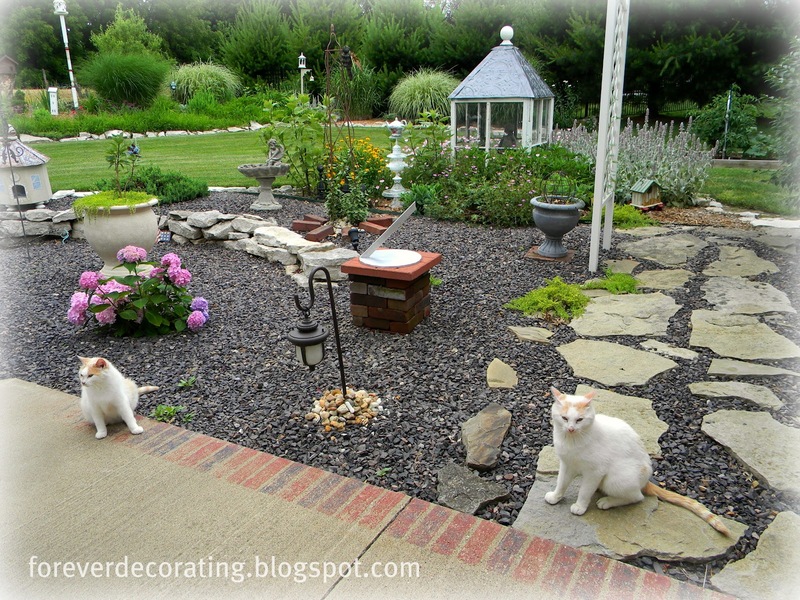 Love what you did with the border and the pedestal for your son's sun dial is perfect. Thanks for sharing your lovely yard. Looks wonderful. Thanks for sharing at Bacon Time. I LOVE THIS LOOK! this makes your yard look so awesome!! I love the look of it, I don't know if I have ever seen that before, but it's great! And what a great deal on the brick! Plus you have a great yard in general and such pretty grass! I would love for you to link this up at our party, and would love for you to start joining our party every week! Beautiful! Love this! Thank you for joining me at Home Sweet Home! I absolutely LOVE this! And I pinned and then....I am going to start my own brick edging! Hi Terry! I just came over from your feature at Stuff and Nonsense! I love your garden with the brick border. Wow, your hard work paid off! It looks beautiful! I too love to garden and I am just itching to get out and do some planting soon (still a bit too cold here in northern Michigan!) I look forward to following your blog! Your yard looks beautiful!!! You and your husband have done such a wonderful job. I was dying to get my hands on some of the brick from the buildings on Broadway that were torn down! Stunning! I wish I could come across some old brick. Had a lot at my old house, but got divorced and am starting over in my current yard. Wow, you got a heck of a deal for those bricks! I love your place! And the brick border is so rich looking...it really makes the grass look green and lush! Thanks for sharing your space...definitely one of my top picks from last week Sunday Blog Love! Wishing you and your hubby a wonderful weekend! Great use of the old brick. It does look great and you are right, it is easy to maintain both the brick AND the yard. 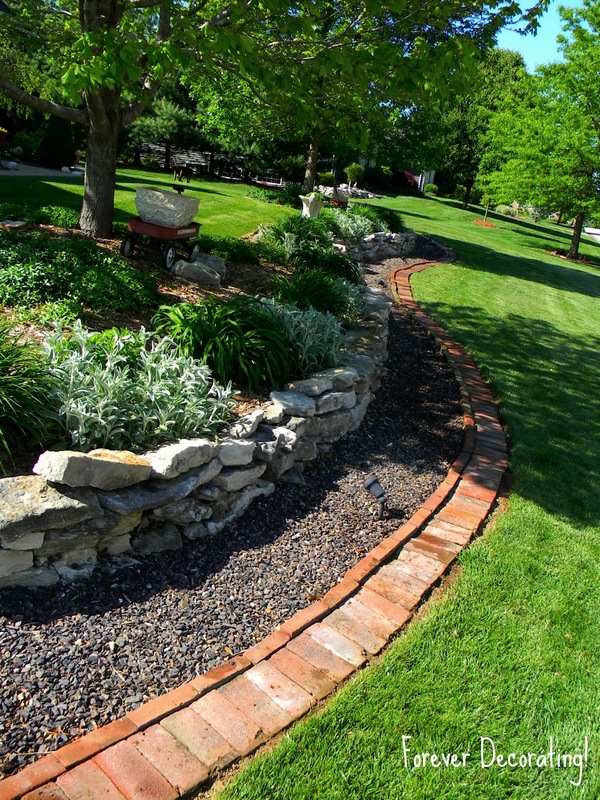 Mowers are able to drive right up onto the brick edge, not get in bark, and trim the grass without needing to edge or weed. I bet your arms hurt that night! It looks fantastic and your new garage is lovely! I am stopping by from Fishtail Cottage's blog hop. I am also a new follower. Have a great week! That is just gorgeous! What a lot of work it must have been. 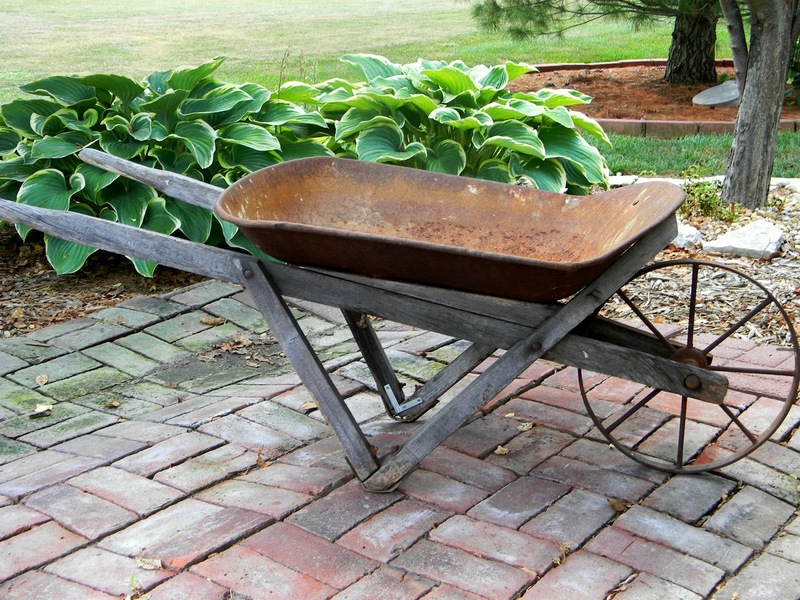 We have been installing a couple of large rose trellis and arbors, and my poor hubby had to haul buckets of gravel up to the area--no driveway access. He was not a happy camper, but it's now done and looks great! Very worth the effort, you yard is so beautiful! My little piece of nature! My NEW Old Bridge Arm Lamp! Header Love AND New Look for My Blog!